Whether you’re Democrat or Republican, you should be able to take a step back and acknowledge Hillary Clinton’s significance. She may represent everything you love or hate about politics, but she’s an educated woman who decided not to live in her husband’s shadow, but truly go all out and make a name for herself. That’s admirable… and it’s a big deal for women. That’s exactly why I find myself so frustrated over Fox News’ senior analyst Brit Hume’s attacks on Clinton following her bid for the presidency. Want to talk about Bengazi? Bring it on. Need to bring up the email controversy? Absolutely valid. Instead, though, Hume went after the Clintons’ marriage. Ummm… what? At 71 years old and known for being conservative, a characteristic he even admitted to the Washington Post, we can only take this to mean that he truly doesn’t understand a modern marriage. You wouldn’t think this would be the case: Hume’s wife is Vice President of Fox News. Yet what could have caused him to pass judgment on the Clintons and call their marriage “weird?” Is it because Bill cheated and Hillary forgave him? Or is it because the former president now takes the backseat while his wife pursues her own career aspirations? Yes, every now and then rumors of Bill’s continued infidelity rear their heads, but more recent rumors have never been anything more than whispers among haters. The bigger issue, though, isn’t whether or not the former president cheats but why it’s Hume’s business to pass judgment on their marriage as a whole. If Hume, Fox News and the Republican Party ever want to stand a chance of earning votes from young progressives, they must stop passing judgment. Newsflash to the most vocal gang of senior citizens around: The Clinton marriage is actually worthy of praise and emulation. Feisty women everywhere were calling for Hillary to file for divorce when the Monica Lewinsky scandal began heating up. The outrage among women brought to mind images of 1950s housewives in house coats smacking frying pans against their hands. And, no, we certainly couldn’t blame Hillary if she had decided the cheating was too much to put behind her. Instead, we watched her weather the storm and come out on top. You need to have a lot of faith in your husband, your marriage and yourself to stay together after infidelity, but the Clintons did it. It’s awesome. It seems as though the “weirdest” thing about the Clintons’ marriage for conservatives rooted in the past might just be that Hillary is the spouse in the limelight. The wife is currently the one with more power and more responsibility. If Hillary becomes president, she’ll be commander-in-chief and Bill will be the pretty, smiling arm candy with the pet projects. For decades, their marriage has quietly challenged traditional patriarchy. If Hillary wins, they’ll flip it on its head. Let’s be real: In a Christian, conservative mindset “traditional family values” aren’t just about “a man and a woman.” They’re also about a woman’s place within the family and, on a bigger level, in society. The talking gray heads at Fox News and in the RNC aren’t just bothered by the Clintons’ marriage. They’re frightened by everything their marriage and Hillary’s campaign means for those “values.” Need proof that conservatives can’t deal with a woman at the top? Look no further than the current struggle women are facing to become church heads in nearly every religion and denomination. They’re terrified of change and “Madame President” represents the ultimate evolution of power. 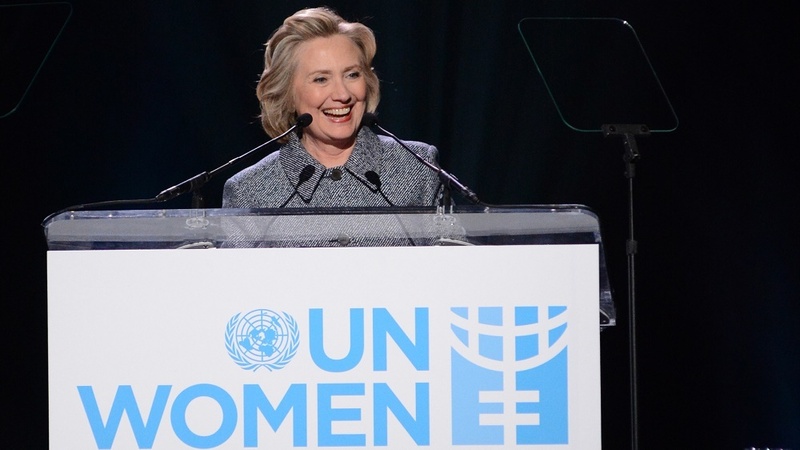 It’s frustrating… but it’s more proof that a female president is exactly what we need. Our biggest issue with all of this isn’t just that Hume attacked a perfectly admirable relationship, but that he attacked a relationship at all. Even if all the rumors are right. Even if Hillary has a thing for women and Bill is the biggest philanderer in Harlem, who are we to judge? Hillary went to Yale Law School. She’s worked her way into some powerful positions and earned a lot of valuable experience. What goes on in her bedroom is no one’s business. What you do in the bedroom and who you invite into your bed has no impact on your intelligence and your ability to lead. The sooner Hume and his employers realize that, the sooner the world will be an infinitely better place. What’s next for women now that equal pay laws are set to change in the UK?